Lazy Susans have come a long way from the simple turntable your mother stored spices on. 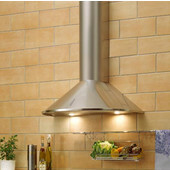 While those understated designs still exist, the market has expanded to include many cabinet-mounted and blind corner lazy susans in an array of shapes, styles and materials. These sophisticated innovations may be more daunting to shop for, but rest assured that our comprehensive guide will break down your options and how to install them. For entertaining, nothing beats a tabletop lazy susan, which is simply placed where you need it to keep condiments and sauces within reach. 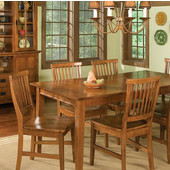 Cabinet-mount lazy susans rotate upon an adjustable center pole that stretches to fit your cabinet height. 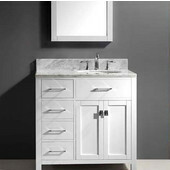 An array of styles are available to suite your specific cabinet type, usually offered in polymer, wood or wire. When deciding what size lazy susan you need for your cabinet, you need to measure the inside depth of the cabinet from the back wall to just inside the door frame. Then, measure the inside width of the cabinet from left to right. Subtract 2 to 4-inches from the smaller of the two measurements for clearance around the shelf. 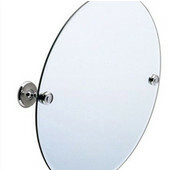 The result is the diameter of the largest lazy susan that can fit inside your kitchen cabinet. 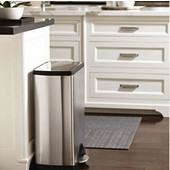 Lazy susans are sold in diameters of even numbers, so a 36 or 39-inch corner cabinet will typically use a 32-inch lazy susan, while a 33-inch corner cabinet would use a 28-inch susan. 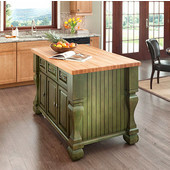 Pie-shaped lazy susans will have larger diameters to accommodate deeper corner cabinets in your kitchen. Most lazy susans have miniumum and maximum inside cabinet height dimensions specified on the page. 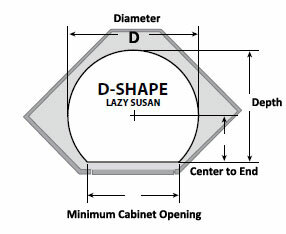 D-Shaped susans are designed for use in standard cabinets and corner cabinets with a 45-degree angle door. First, determine your minimum cabinet width to ensure your installation will fit. Measure left to right within the face frame (also measure top to bottom and note the height). 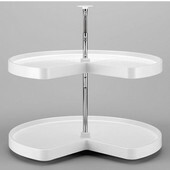 Subtract a few inches from each side to ensure your Lazy Susan can spin comfortably. 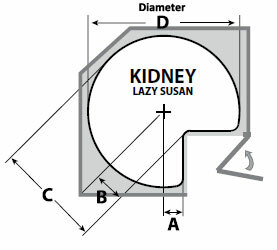 This is an appropriate diameter for your susan (D on the figure above). 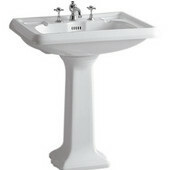 For example, a 22-inch diameter tray is a good fit for a 24-inch cabinet. 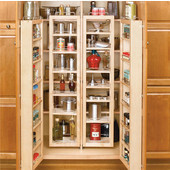 Most installations feature a telescoping shaft that expands vertically to hold your lazy susan in place. Refer to the individual product page for a range of suitable cabinet heights, making sure yours falls within that range. 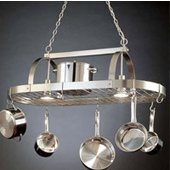 These handy susans feature multi-shelved designs with fixed or independently rotating trays. Similarly, full round lazy susans are among the most versatile of options. 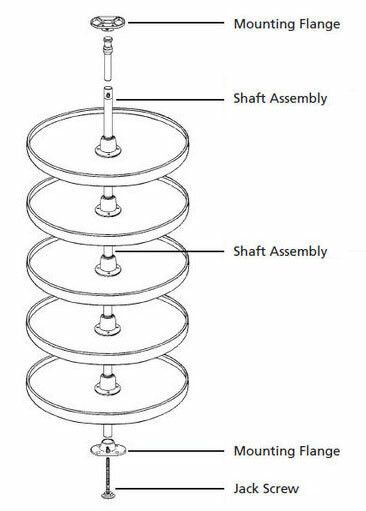 Round susans fit in most regular or corner cabinets in upper or lower positions, also offered in dependent or independently rotating shelves made from polymer, wire or wood. Designed to work with corner cabinets that have unattached double folding doors, kidney lazy susans feature independently rotating shelves. 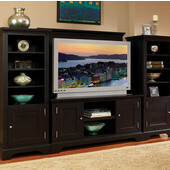 These unique designs can be mounted after cabinets are installed, ideal for older homes or new construction. First, ensure your installation will fit. Measure from the corner inset to the back wall (C on figure above) and from the widest sides left to right (D on figure above). 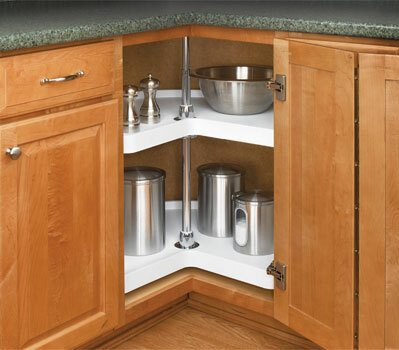 Also note the height: Most cabinet installations feature a twist and lock shaft that is appropriate for a range of cabinet heights. Ensure yours is not too short or tall. Half round lazy susans are mounted directly to the cabinet door, and pivot around when opened, allowing you to access a blind corner cabinet. When shelves pivot around, items in the back are brought within reach. 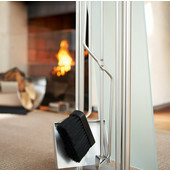 Ball-bearing slides enable the shelves to pull out smoothly when door is opened. 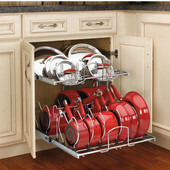 Most are sized to fit cabinet openings ranging from 12"-19-1/2". Some installations, like in the diagram above, feature independently pivoting or gliding shelves. 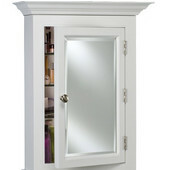 To measure, ensure that your cabinet opening is no smaller than the half-moon's width (B in figure above), and that it is no shorter than this dimension front to back. Corner cabinets typically have ample room, but unless you have super-long arms or are handy with a grabber tool, you are probably loosing a lot of space in the hard-to-reach cabinet depths. A corner system features pullout shelves that are activated when the door is opened or a lever is pulled, bringing your shelving within reach. The first task is to determine your minimum cabinet size. For the minimum opening, measure the door space inside the face frame from left to right. 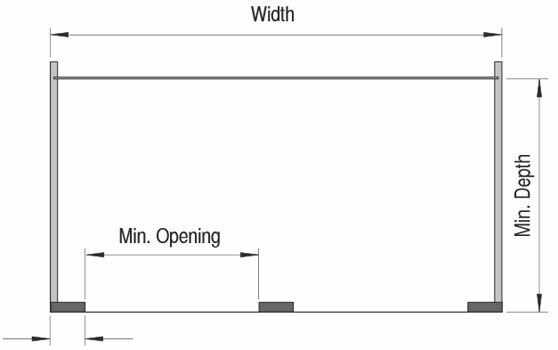 The minimum depth is from the front face frame to the back wall. Also note the height, top to bottom within the face frame. 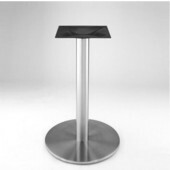 Swing out systems from Hafele and Vauth-Sagel provide maximum space but require very accurate measurements. Slide-out units by Knape & Vogt or Rev-A-Shelf, for example, are typically easier to measure. 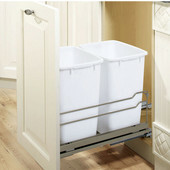 Plus they offer deeper baskets with squared edges, perfect for stashing non-perishables and cookware.